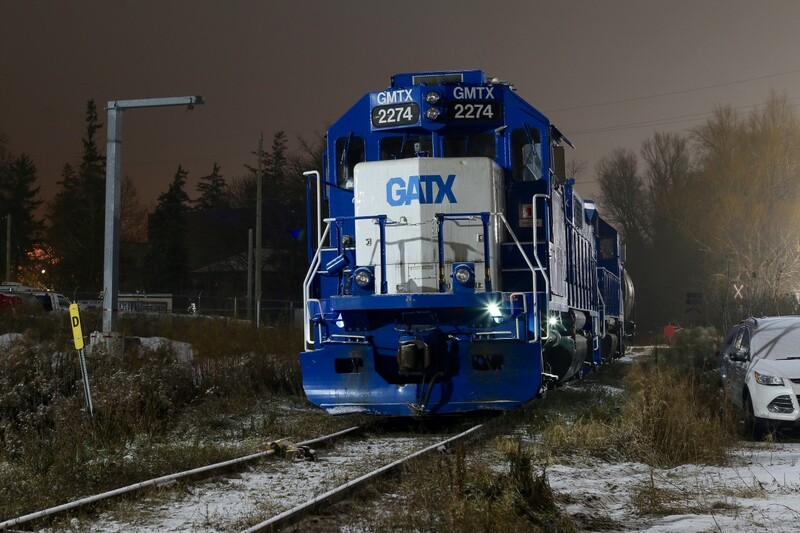 Railpictures.ca - Marcus W Stevens Photo: A light coat of fresh snow brightens up the scene at Preston as a pair of GMTX GP38-2′s assigned to local train 542 idle the night away. It is nice to see CN continuing the practice of storing power here since the end of Goodrich-Exeter’s operations over the line. Tonight there are no cars on the lumber yard spur but a tank car completes the train set, which was lifted west of Guelph. The history of GMTX is a bit questionable as I can’t find any solid information on it, reportedly it is a former Long Island RR unit, and the anticlimber might prove that correct but the lack of the marker light housing seems a bit odd unless this is one of the few units that either lacked that detail or has since had it removed. | Railpictures.ca – Canadian Railway Photography – photographie ferroviaire Canadienne. Caption: A light coat of fresh snow brightens up the scene at Preston as a pair of GMTX GP38-2's assigned to local train 542 idle the night away. It is nice to see CN continuing the practice of storing power here since the end of Goodrich-Exeter's operations over the line. Tonight there are no cars on the lumber yard spur but a tank car completes the train set, which was lifted west of Guelph. The history of GMTX is a bit questionable as I can't find any solid information on it, reportedly it is a former Long Island RR unit, and the anticlimber might prove that correct but the lack of the marker light housing seems a bit odd unless this is one of the few units that either lacked that detail or has since had it removed. Love the teardrops above the snow plow. Great shot indeed and I love these units. If they don’t get a model form release it’s a project coming soon! Thanks for the info as well. Big thanks to a friend and fellow Railfan for some updates here. The industry here actually operates a transloading facility for wall boards not lumber, my mistake the lumber facility is on the adjoining spur a block to the north east. The history of GMTX 2274 is formerly LIRR 267 that last served for LLPX as #2245. It’s maye here is GMTX 2289, ex 2279, nee PC 7955. It has also worked for Conrail, EMDX and UP.